Realm of Horror - News and Blog: New "Girls and Corpses" Spring issue is Born! 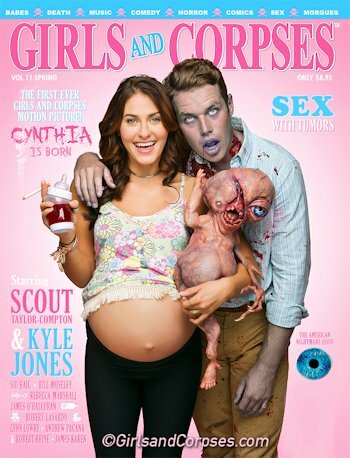 Girls and Corpses delivers all the joys and horrors of childbirth with this special Spring offspring issue, deadicated to our first fully financed feature film, CYNTHIA. The horror/comedy was written and produced by Girls and Corpses Founder/Publisher and Deaditor-In-Chief Robert “Corpsy” Rhine and was directed by Kenny Gage and Devon Downs (Anarchy Parlor, Raze). The film stars, and this issue features exclusive interviews with, several iconic horror stars, many who have appeared on the covers and bloody pages of Girls and Corpses Magazine, including: SCOUT TAYLOR-COMPTON (Rob Zombie’s Halloween and Halloween II), SID HAIG (The Devil’s Rejects, House of 1000 Corpses, Night of The Living Dead 3D), BILL MOSELEY (House of 1000 Corpses, The Texas Chainsaw Massacre 2, The Devil’s Rejects), JAMES KAREN (The Return Of The Living Dead, Poltergiest), REBECCA MARSHALL (Saw 3D, Raze), LYNN LOWRY (The Crazies, Shivers), ROBERT LaSARDO (Death Race, Anarchy Parlor, The Human Centipede 3). And go behind-the-screams of all aspects of this amazing production. Our Spring issue includes features with worked renowned artists: Sandra Yagi, Joshua Hoofing and Trevor Brown. Also: An exclusive interview with Japanese horror director Yoshihiro Nishimura (Tokyo Gore Police); The Russian Granny Ripper and the Russian Stacking Doll Killer; Kids and Corpses; Dead Baby Births; Lego Serial Killers; Emily The Strangled; Movie reviews of She Kills and Peelers; Dead or Alive? ; The Brain That Wouldn’t Die - The Musical; the History of Baby Horror Movies and so much gore! This issue explores the dark side of procreation, is a labor of blood and delivers more surprises than a quintuplet breach birth! You’ll need an epidural after reading it! CYNTHIA… is BORN!